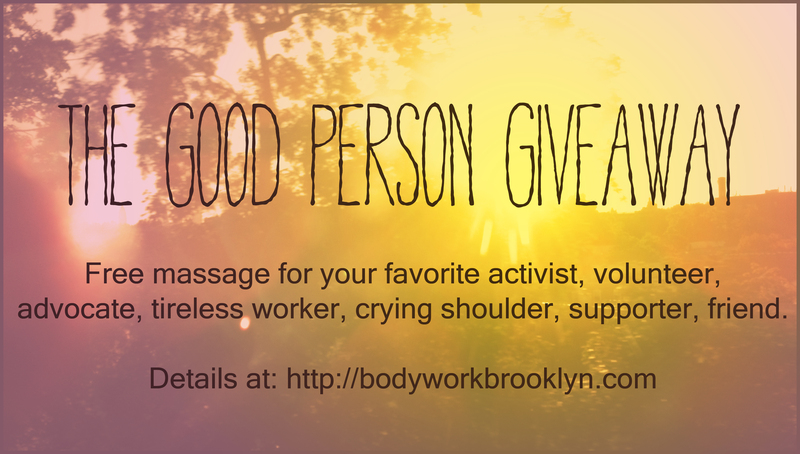 As mentioned in my previous post, next week is EveryBody Deserves a Massage Week. It’s an event that’s been going on since 1995, with the dual purposes of telling people about the benefits of massage and bringing massage to more people. Thinking about the idea that every body deserves a massage gets me thinking about things like accessibility and community. I’m doing a sliding scale next week to try and make massage more accessible. It also seems like a good opportunity to reach out to people who are doing good work and who could use a moment of pure, luxurious comfort. I’m sure we all know someone who’s always looking out for others but rarely taking time for his or herself. Activists, volunteers, advocates, long-hour toilers at NGOs. These aren’t always lucrative endeavors. They don’t always come with recognition, and they don’t always allow the time for true rejuvenation. Self-care matters. Professional care is a lovely bonus. So here’s a chance to send your favorite person for a 90-minute massage, no strings attached. That person who’s always got someone else’s back? Get that back of theirs some unwinding and comfort and ease. Just fill out the form below (and make sure you scroll all the way down and hit “submit”). Here’s the fine print: You can’t nominate yourself. You can share this post with a plea for friends to nominate you, but you can’t nominate yourself. Sorry. I’d love to hear about what kind of good your people have been doing, if they’re supporting organized efforts, or if they just touch a couple hearts at a time. Put it all in the paragraph section of the form below. I’ll choose a winner from the responses submitted. Bonus points for multiple nominations (more than one person submitting the same nominee). Winner will be chosen at the end of the month and contacted by me directly. Information requested is for the sole purpose of the giveaway — you won’t be added to any lists unless you want to be, and none of this information will be shared without your explicit permission. ← Next Week: EveryBody Deserves a Massage!